Faith for life includes two books, each piloted by and developed with the support of people with dementia, families and carers, and pastoral care workers. Purchase these together to receive a bundle discount. 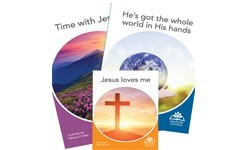 Time with Jesus (24 pages, A4) is part of the Faith for life Devotional series and provides colourful, interactive devotional moments celebrating the life and teaching of Jesus. It is printed on a special polymer stock that feels like paper but is tear and mark resistant. Jesus loves me (24 pages, A5) is part of the Faith for life Discovery series and presents the love of Jesus simply and clearly for older people, especially those who find their memory is not as good as it once was. It is also printed on polymer. He's got the whole world in His hands (44 pages, A4) is our newest and longest resource and is part of the Faith for life Devotional series, presenting Biblical devotions linked to current events for those who enjoy staying up to date with the news. As with the two other books, it is printed on tear and stain resistant polymer stock.